I have had McDonald's only in Bangkok before, and I had never noticed this on the menu, nor had my Bangkok-based Thai friends ever mentioned it before. So when I saw these rice dishes on the menu, I had the urge to order all three, and at the price, I nearly did, but as I had lunch just an hour prior I chose the Kapraw Chicken Rice. I cannot read Thai, so I picked this one randomly because this had egg, and the others didn't. 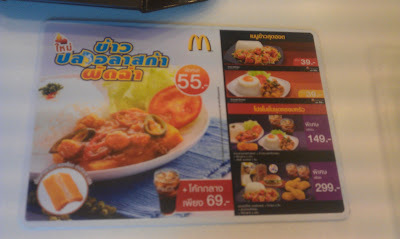 None of the signs in this McDonald's had English (being in North Thailand, near the Laos border, one shouldn't expect it anyway), but the receipt was in English, so that's how I found out what its called. Hopefully on my next trip to Thailand they will still have that fish one, as it looks pretty good too. When I ordered it, I had to go sit down and wait for about 5-10 minutes as they did not have any rice prepared, being 4pm, and not really anyone else in the restaurant, I was surprised. Though, when I did get served, it was definitely worth the wait. It didn't taste like McDonald's at all! First off, because it was cooked to order, it was piping hot, the egg was soft, and the chicken was very flavourful and slightly spicy. Upon further research, Kapraw sauce is a Thai-basil based sauce, and I brought a few packages of it from Tesco's to bring back to Korea. 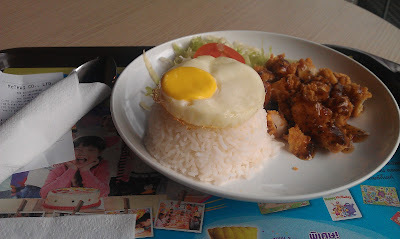 Also, I couldn't believe the size of the portion, for only 39THB, just over a dollar, it beats any of the dollar menu items in the rest of the world.